Semantic Logging Application Block's main focus is event consumption. 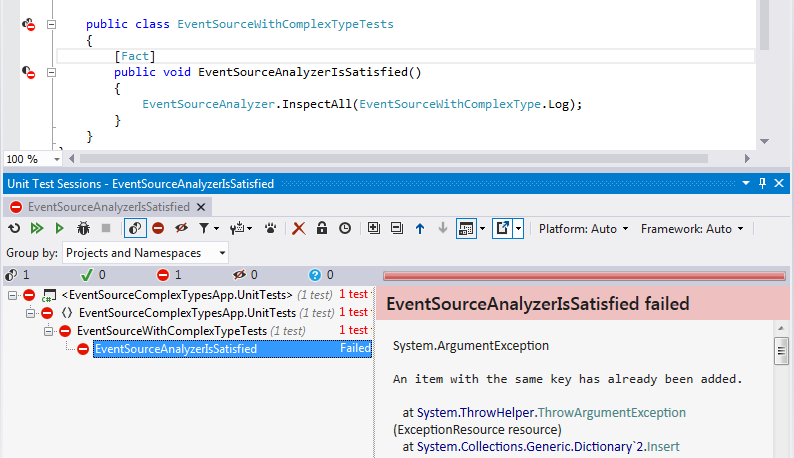 It is based on EventSource introduced in .net framework 4.5. It allows these events to be consumed In-Proc and Out-Proc. But no system is free from any changes. Logging should also accommodate system changes. 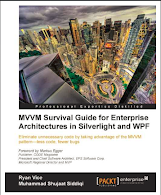 EventSource allows its events to be tagged with version numbers. This is part of metadata defined for the [Event] methods. Let's assume we deploy the example application as developed in previous example. After two months the client calls and asks if we could add an additional fields to Students. The field would be used to record Age of student. Since student creation is being logged, we would need to log this information as well. In this post we will be trying to accommodate this change. It is also possible that we might need to add additional methods to the EventSource due to additional logging needs. We need to make sure that we are assigning them appropriate keywords and levels as expected by the downstream consumption system. As discussed before, they can also be outside the system. We must remember that these versions cannot co-exist in an overloaded fashion in an EventSource as in the following code. As we have discussed before, these methods map to the Event Types for ETW infrastructure, it would generate a duplicate key, which is not allowed. Let's see how our unit test behave in this case. Hmm, it fails with the details about possible issue at runtime because of more that one events with the same name. Let me tell you that the code compiles just fine in this case. This is to save us from experiencing an exception at runtime and then cursing ourselves for missing the obvious. Let's update the definition of the EventSource removing the earlier version of the [Event] method. Since Events are generated to be consumed In-Proc or Out-Proc systems. The events detail can be used by automation system to generate reports and notifications for the infrastructure and management teams responsible for the health and monitoring for the system. They expect a certain payload and message format. Since they can be persisted, the data for historic and current payload structure would co-exist in the persistence storage. They need some way to decide what format to use based on some data. Version is the best candidate for this. The reports can use versioning to decide which payload format should be used by the automation system. We must remember that we cannot enable / disable the events based on versions or even [Event]. Let's update the configuration of Semantic Logging Service for the update. Here we are adding an Azure Sink. The sink is enabled for the EventSource defined above for all the events with a maximum level set as Informational. As we generate these events in the source system. They are provided to the Semantic Logging Service by the ETW infrastructure. TracingService hooks up to the ETW infrastructure for these events. As the events are received they are passed to the avaiable sinks. These sinks are utilized based on their configuration of the events source and keywords they are interested in. For our events, they are pushed to the azure development table storage. Just notice the payload for the new version and old version. In this way, they can be easily identified and operated on. Muhammad bhai, I did not understand the use of version which you first created two versions for Creation and then again you removed. 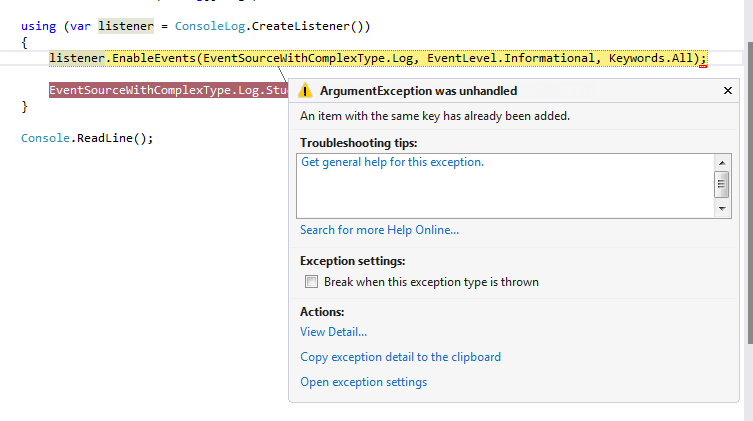 Why is it throwing exception? Muhammad Bhai, This is Nazeer. Thanks for this post, it is very helpful to me. But I have a doubt here, the versioning what you have shown. Firstly you created 2 methods with Version 1 and 2, it gave error and again u revered the changes. I dont understand whether we can use the versioning or not. Not clear as of now. Please provide some details on it. Thanks! Hi Nazeer, I just wanted to explain that although we can create multiple versions of the same events, they cannot co-exist. You would have to get rid of earlier version before introducing a new version of the event.